If you believe the nation's psychics, Jaime Lannister and Brienne of Tarth are probably going to die this season. The Huffington Post had previously tapped a pool of psychics to predict the Super Bowl (the New England Patriots were correctly chosen). 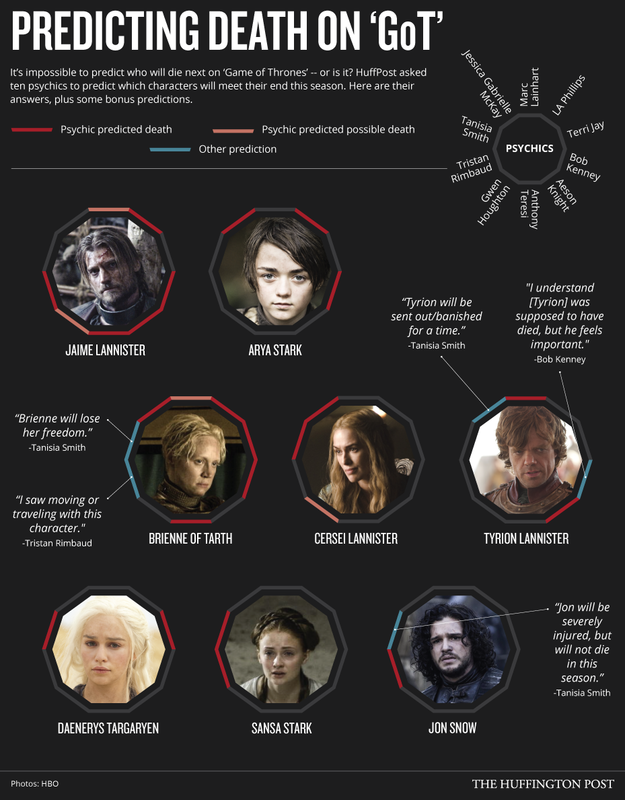 And now, they weigh in to predict who will die during Season 5 of "Game of Thrones." As before, this was approached as an "odd request" and it should be stressed that this is just for fun. As psychic Beth Bennet told HuffPost, "Psychic abilities just don't work like this, but that's not what you want to know ..."
These predictions are especially valuable since the show is supposed to deviate from the book series this season. Multiple psychics also noted that predicting these deaths is a bit different than predicting the Super Bowl, since the scripts already exist and scenes have already been filmed. Jaime Lannister and Brienne of Tarth's lives both seem to be the most at risk. Jon Snow seems to be the most safe. Every character had at least one psychic predict their death. Note: The major characters to choose from were presented to the psychics in this order: Tyrion Lannister, Daenerys Targaryen, Arya Stark, Jon Snow, Sansa Stark, Brienne of Tarth, Jaime Lannister and Cersei Lannister. Evidence outside of the psychic predictions also exists in support of these, especially with regard to frontrunners Jaime and Brienne. The news that Jaime is headed to Dorne this season has sparked rumors that he may be taking over the role Ser Arys Oakheart played in the books. Oakheart's eventual death has huge implications in Cersei's storyline, so it appears someone from the Kingsguard definitely needs to go. Since it's not likely that Jaime is winning the Iron Throne anytime soon, it could be goodbye to the Kingslayer. In addition, book readers know Brienne finds herself in dire circumstances towards the end of George R.R. Martin's book, A Feast for Crows. In the books, her fate is oddly tied into Jaime's, so it doesn't look great for Brienne this season either. It's already been announced that characters will die this season who don't die in the books, so as Martin has said, "Everybody better be on their toes." Graphic by Alissa Scheller for The Huffington Post.